The slow-baked potato does require you to plan early, but man, it makes for a tasty potato. Cutting into my potato (that had baked for about 2 hours and 45 minutes), I found the skin was crispy, and the inside cut like softened butter on my knife. Delicious–like a really high-quality restaurant potato. Three hours is a long time to cook something, but keep in mind that the last 2 hours and 58 minutes are hands-off easy. Go read Alanna’s post if you want more details. Like many people, I eschewed baked potatoes for a while as a source of empty calories high on the GI chart. But they aren’t actually empty, especially if you eat that delicious skin. Potatoes are full of potassium (a potato has more potassium than a banana) and high in fiber, and they contain a good dose of Vitamin C, among other nutrients. A small baked potato also has about 1 oz. of protein in it. I find potatoes deliciously satisfying and filling, especially when I include some extra protein in the topping. And, as Alanna says, 1/4 pound of potato (a small potato) weighs in at only 90 cal, or 1 WW point, whereas a big one is likely to be twice that much. 90 to 180 calories for a rich, satisfying base to a meal is completely reasonable. For those of us who are facing life with no more typical bread, pasta, couscous, etc., it’s great to have a starchy base for a meal that we can load up with toppings like a baked potato. For the potato in the photo, I added a small amount of ghee, 1 T. goat yogurt, 2/3 cup broccoli, 2 T. grated goat cheddar (which I found at Whole Foods), and 2 crumbled pieces of organic bacon. That was my whole dinner, and I was completely satisfied. You can get additional ideas for baked potato fillings here and here. And if you want to add additional veggies to your meal, you can always grill, broil, or roast some vegetable shish kabobs to go alongside. I think I’ve inspired myself, by the way. My husband and I are going to be trying out different baked potato fillings once every week or two for a while now. I’ll report back. . . .
As an aside: an old college friend used to add only A1 Steak Sauce to his baked potato. I never tried this, as I am a fan of the loaded tradition, but I imagine it would be quite tangy. My favorite potato additives these days are rosemary and garlic-butter. Thanks for offering such an array of alternatives for those of us who think outside the box so rarely. I love your new post, too. So glad you enjoyed the slow potatoes! I just wish growers would actually raise small baking potatoes – mostly they’re close to a whole pound. YIKES. This is one of my family’s favorite dinners – we do usually microwave them and I know there is no comparison in taste it lets me get dinner on the table in fifteen minutes! With two kids and a busy schedule that just can’t be beat. 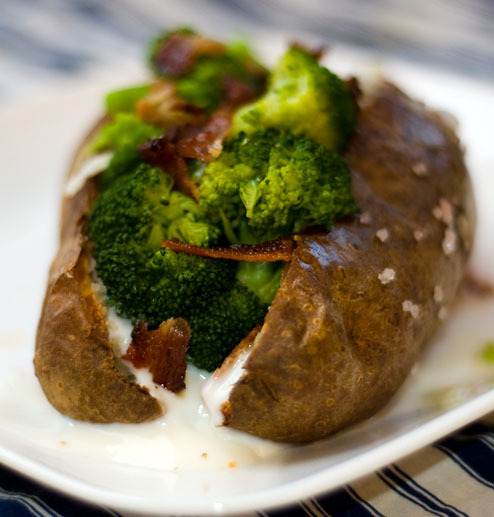 Another plus for us is that baked potatoes are so flexible – everyone can have whatever topping they want and that really makes my kids happy. Thanks for the topping suggestions – I needed some new ideas for this old favorite. Alanna, I always buy organic potatoes, so maybe that helps me get ones that are of a reasonable size? I should weigh them. I don’t eat potatoes any more, but have you tried straining your goat milk yogurt in a coffee filter? I’ve done this with cow’s milk yogurt, and you get something somewhere between sour cream and goat cheese in texture. That would solve your runniness problem, I bet. baked potatoes are awesome,I would leave the cheese out,it doesn’t combine well and gives digestive problems. Late to the conversation but I wanted to support those who use salad dressing on baked potatoes or hot pasta. For decades…literally…I used a Hidden Valley flavor they no longer offer. I’ve since found a replacemement that meets restricted diet and also tastes good. Try Lucini’s Tuscan vinegrette and see if you agree. Sally have you baked 6 or 8 potatoes at once anticipating future meals? If so, have you found a preferred method of reheating? I love the taste of long-baked potatoes but don’t want to leave my oven on that long for just one! I haven’t tried baking in volume and wonder if that would be ill advised.